Placing virtualization agents in the switches which comprise the SAN fabric. Higher level virtualization management functions are provided in an external management server. Conventional HBAs can be utilized in the hosts and storage units. In a first embodiment, a series of HBAs are provided in the switch unit. The HBAs connect to bridge chips and memory controllers to place the frame information in dedicated memory. Routine translation of known destinations is done by the HBA, based on a virtualization table provided by a virtualization CPU. If a frame is not in the table, it is provided to the dedicated RAM. Analysis and manipulation of the frame headers is then done by the CPU, with a new entry being made in the HBA table and the modified frames then redirected by the HBA into the fabric. This can be done in either a standalone switch environment or in combination with other switching components located in a director level switch. In an alternative embodiment, specialized hardware scans incoming frames and detects the virtualized frames which need to be redirected. The redirection is then handled by translation of the frame header information by hardware table-based logic and the translated frames are then returned to the fabric. Handling of frames not in the table and setup of hardware tables is done by an onboard CPU. This application is related to and incorporates by reference, U.S. patent applications Ser. No. 10/209,743, entitled “Method And Apparatus For Virtualizing Storage Devices Inside A Storage Area Network Fabric,” by Naveen Maveli, Richard Walter, Cirillo Lino Costantino, Subhojit Roy, Carlos Alonso, Mike Pong, Shahe H. Krakirian, Subbarao Arumilli, Vincent Isip, Daniel Chung, and Steve Elstad, filed concurrently herewith, and U.S. Pat. No. 10/209,694, now U.S. Pat. No. 7,120,728 entitled “Hardware-Based Translating Virtualization Switch,” by Shahe H. Krakirian, Richard Walter, Subbarao Arumilli, Cirillo Lino Costantino, Vincent Isip, Subhojit Roy, Naveen Maveli, Daniel Chung, and Steve Elstad, filed concurrently herewith, such applications hereby being incorporated by reference. The present invention relates to storage area networks, and more particularly to virtualization of storage attached to such storage area network by elements contained in the storage area network. As computer network operations have expanded over the years, storage requirements become very high. It is desirable to have a large number of users access common storage elements to minimize the cost of obtaining sufficient storage elements to hold the required data. However, this has been difficult to do because of the configuration of the particular storage devices. Originally storage devices were directly connected to the relevant host computer. Thus, it was required to provide enough storage connected to each host as would be needed by the particular applications running on that host. This would often result in a requirement of buying significantly more storage than immediately required based on potential growth plans for the particular host. However, if those plans did not go forward, significant amounts of storage connected to that particular host would go unused, therefore wasting the money utilized to purchase such attached storage. Additionally, it was very expensive, difficult and time consuming to transfer unused data storage to a computer in need of additional storage, so the money remained effectively wasted. In an attempt to solve this problem storage area networks (SANs) were developed. In a SAN the storage devices are not locally attached to the particular hosts but are connected to a host or series of hosts through a switched fabric, where each particular host can access each particular storage device. In this manner multiple hosts could share particular storage devices so that storage space could be more readily allocated between the particular applications on the hosts. While this was a great improvement over locally attached storage, the problem does develop in that a particular storage unit is underutilized or fills up due to misallocations or because of limitations of the particular storage units. So the problem was reduced, but not eliminated. To further address this problem and allow administrators to freely add and substitute storage as desired for the particular network environment, there has been a great push to virtualizing the storage subsystem, even on a SAN. In a virtualized environment the hosts will just see very virtual large disks of the appropriate size needed, the size generally being very flexible according to the particular host needs. A virtualization management device allocates the particular needs of each host among a series of storage units attached to the SAN. Elements somewhere in the network would convert the virtual requests from the series into physical requests to the proper storage unit. While this concept is relatively simple to state, in practice it is relatively difficult to execute in an efficient and low cost manner. As will be provided in more detail in the detailed description, various alternatives have been developed. In a first approach, the storage units themselves were virtualized at the individual storage array level, as done by EMC Corporation's Volume Logix Virtualization System. However, this had shortcomings that did not span multiple storage arrays adequately and was vendor specific. The next approach was a host-based virtualization approach, such as done in the Veritas Volume Manager, where virtualization is done by drivers in the hosts. This approach has the limitation that it is not optimized to span multiple hosts and can lead to increased management requirements when multiple hosts are involved. Another approach was the virtualization appliance approach, such as that developed by FalconStor Software, Inc. in their IPStor product family, where all communications from the hosts go through the virtualization appliance prior to reaching the SAN fabric. This virtualization appliance approach has problems relating to scalability, performance, and ease of management if you must use multiple virtualization appliances for performance reasons. An improvement on those three techniques is an asymmetric host/host bus adapter (HBA) approach such as done by the Compaq Computer Corporation (now Hewlett-Packard Company) Versastor product. In the Versastor product, special HBAs are installed in the various hosts which communicate with a management server. The management server communicates with the HBAs in the various hosts to provide virtualization information which the HBAs then perform internally, thus acting as individual virtualization appliances. However, disadvantages of this particular approach are the use of the special HBAs and trusting of the host/HBA combination to obey the virtualization information provided by the management server. So while all of these approaches do in some manner address the virtualization storage problem, they each provide additional problems which need to be addressed for a more complete solution. The preferred embodiments according to the present invention provide a more complete and viable solution to the virtualization problem by placing the virtualization agents in the switches which comprise the SAN fabric. By placing the virtualization agents in the actual SAN fabric itself, all host and operating system complexities are removed. Preferably all higher level virtualization management functions are provided in an external management server. Conventional HBAs can be utilized in the hosts and storage units and scalability and performance issues are not limited as in the virtualization appliance embodiments as the virtualization switch alternative is significantly more integrated into the SAN. A number of different preferred embodiments of virtualization using a switch located in the SAN fabric are provided. In a first embodiment, a series of HBAs are provided in the switch unit. The HBAs connect to bridge chips and memory controllers to place the frame information in dedicated memory. Routine translation of known destinations is done by the HBA itself, based on a virtualization table provided by a virtualization CPU. If a frame is not in the table, it is provided to the dedicated RAM. Analysis and manipulation of the frame headers is then done by the CPU, with a new entry being made in the HBA table and the modified frames then redirected by the HBA into the fabric. This embodiment can be installed in either a standalone switch environment or in combination with other switching components located in a director level switch. In an alternative embodiment, specialized hardware, in either an FPGA or an ASIC, scans incoming frames and detects the virtualized frames which need to be redirected. The redirection is then handled by translation of the frame header information by hardware table-based logic and the translated frames are then returned to the fabric Handling of frames not in the table and setup of hardware tables is done by an onboard CPU. Several variations exist of this design. In a further embodiment, the routing and mapping logic is contained in the hardware for each particular port of a switch, with common, centralized virtualization tables and CPU control. With these particular designs according to the invention, the actual routing of the majority of the frames is done at full wire speed, thus providing great throughput per particular link, which allows all operations between hosts and storage devices to be virtualized with very little performance degradation and at a relatively low cost. FIG. 22 is an operational flow diagram of the operation of the switches of FIGS. 16 and 20. FIG. 24C is a flowchart illustration of the operation of the VFT blocks of the pi FPGA and the alpha ASIC of FIGS. 16 and 20. FIGS. 30, 31, and 32 are block diagrams of the Fibre Channel switching port element of the switch of FIG. 28. Referring now to FIG. 1, a storage area network (SAN) 100 generally illustrating a prior art design is shown. A fabric 102 is the heart of the SAN 100. The fabric 102 is formed of a series of switches 110, 112, 114, and 116, preferably Fibre Channel switches according to the Fibre Channel specifications. The switches 110-116 are interconnected to provide a full mesh, allowing any nodes to connect to any other nodes. Various nodes and devices can be connected to the fabric 102. For example a private loop 122 according to the Fibre Channel loop protocol is connected to switch 110, with hosts 124 and 126 connected to the private loop 122. That way the hosts 124 and 126 can communicate through the switch 110 to other devices. Storage unit 132, preferably a unit containing disks, and a tape drive 134 are connected to switch 116. A user interface 142, such as a work station, is connected to switch 112, as is an additional host 152. A public loop 162 is connected to switch 116 with disk storage units 166 and 168, preferably RAID storage arrays, to provide storage capacity. A storage device 170 is shown as being connected to switch 114, with the storage device 170 having a logical unit 172 and a logical unit 174. It is understood that this is a very simplified view of a SAN 100 with representative storage devices and hosts connected to the fabric 102. It is understood that quite often significantly more devices and switches are used to develop the full SAN 100. Turning then to FIG. 2, a first prior art embodiment of virtualization is illustrated. Host computers 200 are connected to a fabric 202. Storage arrays 204 are also connected to the fabric 202. A virtualization agent 206 interoperates with the storage arrays 204 to perform the virtualization services. An example of this operation is the EMC Volume Logix operation previously described. The drawback of this arrangement is that it generally operates on only individual storage arrays and is not optimized to span multiple arrays and further is generally vendor specific. FIG. 3 illustrates host-based virtualization according to the prior art. In this embodiment the hosts 200 are connected to the fabric 202 and the storage arrays 204 are also connected to the fabric 202. In this case a virtualization operation 208 is performed by the host computers 200. An example of this is the Veritas Volume Logix manager as previously discussed. In this case the operation is not optimized for spanning multiple hosts and can have increased management requirements when multiple hosts are involved due to the necessary intercommunication. Further, support is required for each particular operating system present on the host. FIG. 4 illustrates the use of a virtualization appliance according to the prior art. In FIG. 4 the hosts 200 are connected to a virtualization appliance 210 which is the effective virtualization agent 212. The virtualization appliance 210 is then connected to the fabric 202, which has the storage arrays 204 connected to it. In this case all data from the hosts 200 must flow through the virtualization appliance 210 prior to reaching the fabric 202. An example of this is products using the FalconStor IPStor product on an appliance unit. Concerns with this design are scalability, performance, and ease of management should multiple appliances be necessary because of performance requirements and fabric size. A fourth prior art approach is illustrated in FIG. 5. This is referred to as an asymmetric host/host bus adapter (HBA) solution. One example is the VersaStor system from Compaq Computer Corporation (now Hewlett Packard Company). In this case the hosts 200 include specialized HBAs 214 with a virtualization agent 216 running on the HBAs 214. The hosts 200 are connected to the fabric 202 which also receives the storage arrays 204. In addition, a management server 218 is connected to the fabric 202. The management server 218 provides management services and communicates with the HBAs 214 to provide the HBAs 214 with mapping information relating to the virtualization of the storage arrays 204. There are several problems with this design, one of which is that it requires special HBAs, which may require the removal of existing HBAs in an existing system. In addition, there is a security gap in that the HBAs and their host software must obey and follow the virtualization mapping rules provided by the management server 218. However, the presence of the management server 218 does simplify management operations and allows better scalability across multiple hosts and/or storage devices. Referring now to FIG. 6, a block diagram according to the preferred embodiment of the invention is illustrated. In FIG. 6 the hosts 200 are connected to a SAN fabric 250. Similarly, storage arrays 204 are also connected to the SAN fabric 250. However, as opposed to the SAN fabric 202 which is made with conventional Fibre Channel switches, the fabric 250 includes a series of virtualization switches 252 which act as the virtualization agents 254. A management server 218 is connected to the fabric 250 to manage and provide information to the virtualization switches 252 and to the hosts 200. This embodiment has numerous advantages over the prior art designs of FIGS. 2-5 by eliminating interoperability problems between hosts and/or storage devices and solves the security problems of the asymmetric HBA solution of FIG. 5 by allowing the hosts 200 to be conventional prior art hosts. Management has been simplified by the use of the management server 218 to communicate with the multiple virtualization switches 252. In this manner, both the hosts 200 and the storage arrays 204 can be conventional devices. As the virtualization switch 252 can provide the virtualization remapping functions at wire speed, performance is not a particular problem and this solution can much more readily handle much larger fabrics by the simple addition of additional virtualization switches 252 as needed. FIG. 6A illustrates a dual fabric SAN. Hosts 200-1 connect to a first SAN fabric 255, with storage arrays 204-1 also connected to the fabric 255. Similarly hosts 200-2 connect to a second SAN fabric 256, with storage arrays 204-2 also connected to the fabric 256. A virtualization switch 257 is contained in both fabrics 255 and 256, so the virtualization switch 257 can virtualize devices across the two fabrics. FIG. 6B illustrates the dual fabric SAN of FIG. 6A in a redundant topology where each host 200 and each storage array 204 is connected to each fabric 255 and 256. Referring now to FIG. 7A, a simple four switch fabric 260 according to the prior art is shown. Four switches 262 are interconnected to provide a full interconnecting fabric. Referring then to FIG. 7B, the fabric 260 is altered as shown to become a fabric 264 by the addition of two virtualization switches 252 in addition to the switches 262. As can be seen, the virtualization switches 252 are both directly connected to each of the conventional switches 262 by inter-switch links (ISLs). This allows all virtualization frames to directly traverse to the virtualization switches 252, where they are remapped or redirected and then provided to the proper switch 262 for provision to the node devices. As can be seen in FIG. 7B, no reconfiguration of the fabric 260 is required to form the fabric 264, only the addition of the two virtual switches 252 and additional links to those switches 252. This allows the virtualization switches 252 to be added while the fabric 260 is in full operation, without any downtime. FIG. 8A illustrates a prior art core-edge fabric arrangement 270. In the illustrated embodiment of FIG. 8A, 168 hosts are connected to a plurality of edge switches 272. The edge switches 272 in turn are connected to a pair of core switches 274 which are then in turn connected to a series of edge switches 276 which provide the connection to a series of 56 storage ports. This is considered to be a typical large fabric installation. This design is converted to fabric 280 as shown in FIG. 8B by providing virtualization at the edge of the fabric. The edge switches 272 in this case are connected to a plurality of virtualization switches 252 which are then in turn connected to the core switches 274. The core switches 274 as in FIG. 8A are connected to the edge switches 276 which provide connection to the storage ports. FIG. 9A illustrates an alternative core-edge embodiment of a fabric 290 for interconnection of 280 hosts and forty-eight storage ports. In this embodiment the edge switches 272 are connected to the hosts and then interconnected to a pair of 64 port director switches 292. The director switches 292 are then connected to edge switches 276 which then provide the connection to the storage ports. This design is transformed into fabric 300 by addition of the virtualization switches 252 to the director switches 292. Preferably the virtualization switches 252 are heavily trunked to the director switches 292 as illustrated by the very wide links between the switches 252 and 292. As noted in reference to FIG. 7B this requires no necessary reconnection of the existing fabric 290 to convert to the fabric 300, providing that sufficient ports are available to connect the virtualization switches 252. Yet an additional embodiment is shown in FIGS. 10A and 10B. In FIG. 10A a prior art fabric configuration 310 is illustrated. This is referred to as a four by twenty-four architecture because of the presence of four director switches 292 and twenty-four edge switches 272. As seen, the director switches 292 interconnect with very wide backbones or trunk links. This fabric 310 is converted to a virtualizing network fabric 320 as shown in FIG. 10B by the addition of virtualization switches 252 to the director switches 292. An alternative embodiment is shown in FIGS. 11A and 11B. In the fabric embodiment 321 in FIG. 11A, a first tier of director switches 292 are connected to a central tier of director switches 292 and a lower tier of director switches 292 is connected to that center tier of switches 292. This fabric 320 is converted to a virtualized fabric 322 as shown in FIG. 11B by the connection of virtualization switches 252 to the central tier of directed class switches 292 as shown. FIG. 12 is an illustration of the translations of the header of the Fibre Channel frames according to the preferred embodiment. More details on the format of Fibre Channel frames is available in the FC-PH specification, ANSI X3.230-1994, which is hereby incorporated by reference. Frame 350 illustrates the frame format according to the Fibre Channel standard. The first field is the R_CTL field 354, which indicates a routing control field to effectively indicate the type of frame, such as FC-4 device or link data, basic or extended link data, solicited, unsolicited, etc. The DID field 356 contains the 24-bit destination ID of the frame, while the SID field 358 is the source identification field to indicate the source of the frame. The TYPE field 360 indicates the protocol of the frame, such as basic or extended link service, SCSI-FCP, etc. as indicated by the Fibre Channel standard. The frame control or F_CTL field 362 contains control information relating to the frame content. The sequence ID or SEQID field 364 provides a unique value used for tracking frames. The data field control D_CTL field 366 provides indications of the presence of headers for particular types of data frames. A sequence count or S_CNT field 367 indicates the sequential order of frames in a sequence. The OXID or originator exchange ID field 368 is a unique field provided by the originator or initiator of the exchange to help identify the particular exchange. Similarly, the RXID or responder exchange ID field 370 is a unique field provided by the responder or target so that the OXID 368 and RXID 370 can then be used to track a particular exchange and validated by both the initiator and the responder. A parameter field 371 provides either link control frame information or a relative offset value. Finally, the data payload 372 follows this header information. Frame 380 is an example of an initial virtualization frame sent from the host to the virtualization agent, in this case the virtualization switch 252. As can be seen, the DID field 356 contains the value VDID which represents the ID of one of the ports of the virtualization agent. The source ID field 358 contains the value represented as HSID or host source ID. It is also noted that an OXID value is provided in field 368. This frame 380 is received by the virtualization agent and has certain header information changed based on the mapping provided in the virtualization system. Therefore, the virtualization agent provides frame 382 to the physical disk. As can be seen, the destination ID 356 has been changed to a value PDID to indicate the physical disk ID while the source ID field 358 has been changed to indicate that the frame is coming from the virtual disk ID device of VDID. Further it can be seen that the originator exchange ID field 368 has been changed to a value of VXID provided by the virtualization agent. The physical disk responds to the frame 382 by providing a frame 384 to the virtualization agent. As can be seen, the destination ID field 356 contains the VDID value of the virtualization agent, while the source ID field 358 contains the PDID value of the physical disk. The originator exchange ID field 368 remains at the VXID value provided by the virtualization agent and an RXID value has been provided by the disk. The virtualization agent receives frame 384 and changes information in the header as indicated to provide frame 386. In this case the destination ID field 356 has been changed to the HSID value originally provided in frame 380, while the source ID field 358 receives the VDID value. The originator exchange ID field 368 receives the original OXID value while the responder exchange field 370 receives the VXID value. It is noted that the VXID value is used as the originator exchange ID in frames from the virtualization agent to the physical disk and as the responder exchange ID in frames from the virtualization agent to the host. This allows simplified tracking of the particular table information by the virtualization agent. The next frame in the exchange from the host is shown as frame 388 and is similar to frame 380 except that the VXID value is provided as a responder exchange field 370 now that the host has received such value. Frame 390 is the modified frame provided by the virtualization agent to the physical disk with the physical disk ID provided as the destination ID field 356, the virtual disk ID provided as the source ID field 358, the VXID value in the originator exchange ID field 368 and the RXID value originally provided by the physical disk is provided in the responder exchange ID field 370. The physical disk response to the virtualization agent is indicated in the frame 392, which is similar to the frame 384. Similarly the virtualization agent responds and forwards this frame to the host as frame 394, which is similar to frame 388. As can be seen, there are a relatively limited number of fields which must be changed for the majority of data frames being converted or translated by the virtualization agent. Not shown in FIG. 12 are the conversions which must occur in the payload, for example, to SCSI-FCP frames. The virtualization agent analyzes an FCP-CMND frame to extract the LUN and LBA fields, and in conjunction with the virtual to physical disk mapping, converts the LUN and LBA values as appropriate for the physical disk which is to receive the beginning of the frame sequence. If the sequence spans multiple physical drives, when an error or completion frame is returned from the physical disk when its area is exceeded, the virtualization agent remaps the FCP-CMND frame to the LUN and LBA of the next physical disk and changes the physical disk ID as necessary. FIG. 13 illustrates a virtualization switch 400 according to the present invention. A plurality of HBAs 402 are provided to connect to the fabric of the SAN. Each of the HBAs 402 is connected to an ASIC referred to the Feather chip 404. The Feather chip 404 is preferably a PCI-X to PCI-X bridge and a DRAM memory controller. Connected to each Feather Chip 404 is a bank of memory or RAM 406. This allows the HBA 402 to provide any frames that must be forwarded for further processing to the RAM 406 by performing a DMA operation to the Feather chip 404, and into the RAM 406. Because the Feather chip 404 is a bridge, this DMA operation is performed without utilizing any bandwidth on the second PCI bus. Each of the Feather chips 404 is connected by a bus 408, preferably a PCI-X bus, to a north bridge 410. Switch memory 412 is connected to the north bridge 410, as are one or two processors or CPUs 414. The CPUs 414 use the memory 412 for code storage and for data storage for CPU purposes. Additionally, the CPUs 414 can access the RAM 406 connected to each of the Feather chips 404 to perform frame retrieval and manipulation as illustrated in FIG. 12. The north bridge 410 is additionally connected to a south bridge 416 by a second PCI bus 418. CompactFlash slots 420, preferably containing CompactFlash memory which contains the operating system of the switch 400, are connected to the south bridge 416. An interface chip 422 is connected to the bus 418 to provide access to a serial port 424 for configuration and debug of the switch 400 and to a ROM 426 to provide boot capability for the switch 400. Additionally, a network interface chip 428 is connected to the bus 418. A PHY, preferably a dual PHY, 430 is connected to the network interface chip 428 to provide an Ethernet interface for management of the switch 400. The operational flow of a frame sequence using the switch 400 of FIG. 13 is illustrated in FIGS. 14A, 14B and 14C. A sequence starts at step 450 where an FCP_CMND or command frame is received at the virtualization switch 400. This is an unsolicited command to an HBA 402. This command will be using HSID, VDID and OXID as seen in FIG. 12. The VDID value was the DID value for this frame due to the operation of the management server. During initialization of the virtualization services, the management server will direct the virtualization agent to create a virtual disk. The management server will query the virtualization agent, which in turn will provide the IDs and other information of the various ports on the HBAs 402 and the LUN information for the virtual disk being created. The management server will then provide one or more of those IDs as the virtual disk ID, along with the LUN information, to each of the hosts. The management server will also provide the virtual disk to physical disk swapping information to the virtualization agent to enable it to build its redirection tables. Therefore requests to a virtual disk may be directed to any of the HBA 402 ports, with the proper redirection to the physical disk occurring in each HBA 402. In step 452 the HBA 402 provides this FCP_CMND frame to the RAM 406 and interrupts the CPU 414, indicating that the frame has been stored in the RAM 406. In step 454 the CPU 414 acknowledges that this is a request for a new exchange and as a result adds a redirector table entry to a redirection or virtualization table in the CPU memory 412 and in RAM 406 associated with the HBA 402 (or alternatively, additionally stored in the HBA 402). This table entry to both of the memories is loaded with the HSID, the PDID of the proper physical disk, the VDID, the originator or OXID exchange value and the VXID or virtual exchange value. Additionally, the CPU provides the VXID, PDID, and VDID values to the proper locations in the header and proper LUN and LBA values in the body of the FCP_CMND frame the RAM 406 and then indicates to the HBA 402 that the frame is available for transmission. In step 456 the HBA 402 sends the redirected and translated FCP_CMND frame to the physical disk as indicated as appropriate by the CPU 414. In step 458 the HBA 402 receives an FCP_XFER_RDY frame from the physical disk to indicate that it is ready for the start of the data transfer portion of the sequence. The HBA 402 then locates the proper table entry in the RAM 406 (or in its internal table) by utilizing the VXID sequence value that will have been returned by the physical disk. Using this table entry and the values contained therein, the HBA 402 will translate the frame header values to those appropriate as shown in FIG. 12 for transmission of this frame back to the host. Additionally, the HBA 402 will note the RXID value from the physical disk and store it in the various table entries. In step 460 the HBA 402 receives a data frame, as indicated by the FCP_DATA frame. In step 462 the HBA 402 determines whether the frame is from the responder or the originator, i.e., from the physical disk or from the host. If the frame is from the originator, i.e., the host, control proceeds to step 464 where the HBA 402 locates the proper table entry using the VXID exchange ID contained in the RXID location in the header and translates the frame header information as shown in FIG. 12 for translation and forwarding to the physical disk. Control then proceeds to step 466 to determine if there are any more FCP_DATA frames in this sequence. If so, control returns to step 460. If not, control proceeds to step 468 where the HBA 402 receives an FCP_RSP frame from the physical disk, indicating completion of the sequence. In step 470, the HBA 402 then locates the table entry using the VXID value, DMAs the FCP_RSP or response frame to the RAM 406 and interrupts the CPU 414. In step 472, the CPU 414 processes the completed exchange by first translating the FCP_RSP frame header and sending this frame to the HBA 402 for transmission to the host. The CPU 414 next removes this particular exchange table entry from the memory 412 and the RAM 406, thus completing this exchange operation. Control then proceeds to step 474 where the HBA 402 sends the translated FCP_RSP frame to the host. If this was a return of a frame from the responder, i.e. the disk drive, control proceeds from step 462 to step 476 to determine if the response frame is out of sequence. If not, which is conventional for Fibre Channel operations, the HBA 402 locates the table entry utilizing the VXID value in the OXID location in the header and translates the frame for host transmission. Control then proceeds to step 466 for receipt of additional data frames. If the particular frame is out of sequence in step 476, control proceeds to step 480 where the HBA 402 locates the table entry based on the VXID value and prepares an error response. This error response is provided to the CPU 414. In step 482, the HBA 402 drops all subsequent frames relating to that particular exchange VXID as this is now an erroneous sequence exchange because of the out of sequence operation. Therefore operation of the virtualization switch 400 is accomplished by having the switch 400 setup with various virtual disk IDs, so that the hosts send all virtual disk operations to the switch 400. Any frames not directed to a virtual disk would be routed normally by the other switches in the fabric. The switch 400 then translates the received frames, with setup and completion frames being handled by a CPU 414 but with the rest of the frames handled by the HBAs 402 to provide high speed operation. The redirected frames from the switch 400 are then forwarded to the proper physical disk. The physical disk replies to the switch 400, which redirects the frames to the proper host. Therefore, the switch 400 can be added to an existing fabric with disturbing operations. The switch 400 in FIG. 13 is a standalone switch for installation as a single physical unit. An alternative embodiment of the switch 400 is shown as the switch 490 in FIG. 15 which is designed for use as a pluggable blade in a larger switch, such as the SilkWorm 12000 by Brocade Communications Systems. In this case, like elements have received like numbers. In the switch 490 the HBAs 402 are connected to Bloom chips 492 Bloom chips are mini-switches, preferably eight port mini-switches in a single ASIC. They are full featured Fibre Channel switches. The Bloom chips 492 are connected to an SFP or media interface 494 for connection to the fabric, preferably with four ports directly connecting to the fabric. In addition, each Bloom chip 492 has three links connecting to a back plane connector 496 for interconnection inside the larger switch. Each Bloom chip 492 is also connected to a PCI bridge 498, which is also connected to the backplane connector 496 to allow operation by a central control processor in the larger switch. This provides a fully integrated virtualization switch 490 for use in a fabric containing a director switch. The switch 490 can be like the switch 400 by having the fabric connected to the SFPs 494 or can be connected to the fabric by use of the backplane connector 496 and internal links to ports within the larger switch. Proceeding now to FIG. 16, a diagram of a virtualization switch 500 according to the present invention it is illustrated. In the virtualization switch 500 a pair of FPGAs 502, referred to as the pi FPGAs, provide the primary hardware support for the virtualization translations. Four Bloom ASICs 504 are interconnected to form to Bloom ASIC pairs. A more detailed description of the Bloom ASIC is provided in U.S. patent application Ser. No. 10/124,303, filed Apr. 17, 2002, entitled “Frame Filtering of Fibre channel Frames,” which is hereby incorporated by reference. One of the Bloom ASICs 504 in each pair is connected to one of the pi FPGAs 502 so that each Bloom ASIC pair is connected to both pi FPGAs 502. Each of the Bloom ASICs 504 is connected to a series of four serializer/deserializer chips and SFP interface modules 506 so that each Bloom ASIC 504 provides four external ports for the virtualization switch 500, for a total of sixteen external ports in the illustrated embodiment. Also connected to each pi FPGA 502 is an SRAM module 508 to provide storage for the IO tables utilized in remapping and translation of the frames. Each of the pi FPGAs 502 is also connected to a VER or virtualized exchange redirector 510, also referred to as a virtualization engine. The VER 510 includes a CPU 512, SDRAM 514, and boot flash ROM 516. In this manner the VER 510 can provide high level support to the pi FPGA 502 in the same manner as the CPUs 414 in the virtualization switch 400. A content addressable memory (CAM) 518 is connected to each of the pi FPGAs 502. The CAM 518 contains the VER map table containing virtual disk extent information. A PCI bus 520 provides a central bus backbone for the virtualization switch 500. Each of the Bloom ASICs 504 and the VERs 510 are connected to the PCI bus 520. A switch processor 524 is also connected to the PCI bus 520 to allow communication with the other PCI bus 520 connected devices and to provide overall control of the virtualization switch 500. A processor bus 526 is provided from the processor 524. Connected to this processor bus 526 are a boot flash ROM 528, to enable the processor 524 to start operation; a kernel flash ROM 530, which contains the primary operating system in the virtualization switch 500; an FPGA memory 532, which contains the images of the various FPGAs, such as pi FPGA 502; and an FPGA 534, which is a memory controller interface to memory 536 which is used by the processor 524. Additionally connected to the processor 524 are an RS232 serial interface 538 and an Ethernet PHY interface 540. Additionally connected to the PCI bus 520 is a PCI IDE or integrated drive electronics controller 542 which is connected to CompactFlash memory 544 to provide additional bulk memory to the virtualization switch 500. Thus, as a very high level comparison between switches 400 and 500, the Bloom ASICs 504 and pi FPGAs 502 replace the HBAs 402 and the VERs 510 and processor 524 replace the CPUs 414. The pi FPGA 502 is illustrated in more detail in FIG. 17. The receive portions of the Fibre Channel links are provided to the FC-1(R) block 550. In the preferred embodiment there are eight FC-1(R) blocks 500, one for each Fibre Channel link. Only one is illustrated for simplicity. The FC-1(R) block 550 is a Fibre Channel receive block. Similarly, the transmit portions of the Fibre Channels links of the pi FPGA 502 are connected to an FC-1(T) block 552, which is the transmit portion of the pi FPGA 502. In the preferred embodiment there are also eight FC-1(T) blocks 552, one for each Fibre Channel link. Again only one is illustrated for simplicity. An FC-1 block 554 is interconnected between the FC-1(R) block 550 and the FC-1(T) block 552 to provide a state machine and to provide buffer to buffer credit logic. The FC-1(R) block 550 is connected to two different blocks, a staging buffer 556 and a VFR block 558. In the preferred embodiment there is one VFR block 558 connected to all of the FC-1(R) blocks 550. The staging buffer 556 contains temporary copies of received frames prior to their provision to the VER 510 or header translation and transmission from the pi FPGA 502. In the preferred embodiment there is only one staging buffer 556 shared by all blocks in the pi FPGA 502. The VFR block 558 performs the virtualization table lookup and routing to determine if the particular received frame has substitution or translation data contained in an IO table or whether this is the first occurrence of the particular frame sequence and so needs to be provided to the VER 510 for setup. The VFR block 558 is connected to a VFT block 560. The VFT block 560 is the virtualization translation block which receives data from the staging buffers when an IO table entry is present as indicated by the VFR block 558. In the preferred embodiment there is one VFT block 560 connected to all of the FC-1(T) blocks 552 and connected to the VFR block 558. Thus there are eight sets of FC-1(R) blocks 550, one VFR block 558, one VFT block 560 and eight FC-1(T) blocks 552. Preferably the eight FC-1(R) blocks 550 and FC-1(T) blocks 552 are organized as two port sets of four to allow simplified connection to two fabrics, as described below. The VFT block 560 does the actual source and destination ID and exchange ID substitutions in the frame, which is then provided to the FC-1(T) block 552 for transmission from the pi FPGA 502. The VFR block 558 is also connected to a VER data transfer block 562, which is essentially a DMA engine to transfer data to and from the staging buffers 556 and the VER 510 over the VER bus 566. In the preferred embodiment there is also a single data transfer block 562. A queue management block 564 is provided and connected to the data transfer block 562 and to the VER bus 566. The queue management block 564 provides queue management for particular queues inside the data transfer block 562. The VER bus 566 provides an interface between the VER 510 and the pi FPGA 502. A statistics collection and error handling logic block 568 is connected to the VER bus 566. The statistics and error handling logic block 568 handles statistics generation for the pi FPGA 502, such as number of frames handled, and also interrupts the processor 524 upon certain error conditions. A CAM interface block 570 as connected to the VER bus 566 and to the CAM 518 to allow an interface between the pi FPGA 502, the VER 510 and the CAM 518. FIGS. 18A and 18B provide additional detailed information about the various blocks shown in FIG. 17. The FC-1(R) block 550 receives the incoming Fibre Channel frame at a resync FIFO block 600 to perform clock domain transfer of the incoming frame. The data is provided from the FIFO block 600 to framing logic 602, which does the Fibre Channel ten bit to eight bit conversion and properly frames the incoming frame. The output of the framing logic 602 is provided to a CRC check module 604 to check for data frame errors; to a frame info formatting extraction block 606, which extracts particular information such as the header information needed by the VFR block 558 for the particular frame; and to a receive buffer 608 to temporarily buffer incoming frames. The receive buffer 608 provides its output to a staging buffer memory 610 in the staging buffer block 556. The receive buffer 608 is also connected to an FC-1(R) control logic block 612. In addition, a receive primitives handling logic block 614 is connected to the framing block 602 to capture and handle any Fibre Channel primitives. The staging buffer 556 contains the previously mentioned staging buffer memory 610 which contains in the preferred embodiment at least 24 full length data frames. The staging buffer 556 contains a first free buffer list 616 and a second free buffer list 618. The lists 616 and 618 contain lists of buffers freed when a data frame is transmitted from the pi FPGA 502 or transferred by the receiver DMA process to the VER 510. Staging buffer management logic 620 is connected to the free buffer lists 616 and 618 and to a staging buffer memory address generation block 622. In addition, the staging buffer management block 620 is connected to the FC-1(R) control logic 612 to interact with the receive buffer information coming from the receive buffer 608 and provides an output to the FC-1(T) block 552 to control transmission of data from the staging buffer memory 610. The staging buffer management logic 620 is also connected to a transmit (TX) DMA controller 624 and a receive (RX) DMA controller 626 in the data transfer block 562. The TX DMA and RX DMA controllers 624 and 626 are connected to the VER bus 556 and to the staging buffer memory 610 to allow data to be transferred between the staging buffer memory 610 and the VER SDRAM 514. A receive (RX) DMA queue 628 is additionally connected to the receive DMA controller 626. The received (RX) DMA controller 626 preferably receives buffer descriptions of frames to be forwarded to the VER 510. A buffer descriptor preferably includes a staging buffer ID or memory location value, the received port number and a bit indicating if the frame is an FCP_CMND frame, which allows simplified VER processing. The RX DMA controller 626 receives a buffer descriptor from RX DMA queue 628 and transfers the frame from the staging buffer memory 610 to the SDRAM 514. The destination in the SDRAM 514 is determined in part by the FCP_CMND bit, as the SDRAM 514 is preferably partitioned in command frame queues and other queues, as will be described below. When the RX DMA controller 626 has completed the frame transfer, it provides an entry into a work queue for the VER 510. The work queue entry preferably includes the VXID value, the frame length, and the receive port for command frames, and a general buffer ID instead of the VXID for other frames. The RX DMA controller 626 will have requested this VXID value from the staging buffer management logic 620. The TX DMA controller 624 also includes a small internal descriptor queue to receive buffer descriptors from the VER 510. Preferably the buffer descriptor includes the buffer ID in SDRAM 514, the frame length and a port set bit. The TX DMA controller 624 transfers the frame from the SDRAM 514 to the staging buffer memory 610. When completed, the TX DMA controller 624 provides a TX buffer descriptor to the FC-1(T) block 560. The staging buffer memory 610 preferably is organized into ten channels, one of each Fibre Channel port, one for the RX DMA controller 626 and one for the TX DMA controller 624. The staging buffer memory 610 is also preferably dual-ported, so each channel can read and write at the same time. The staging buffer memory 610 is preferably accessed in a manner similar to that shown in U.S. Pat. No. 6,180,813, entitled “Fibre Channel Switching System and Method,” which is hereby incorporated by reference. This allows each channel to have full bandwidth access to the staging buffer memory 610. Proceeding now to FIG. 18B, the VFR block 558 includes a receive look up queue 630 which receives the frame information extracted by the extraction block 606. Preferably this information includes the staging buffer ID, the exchange context from bit 23 of the F_CTL field, an FCP_CONF_REQ or confirm requested bit from bit 4, word 2, byte 2 of an FCP_RSP payload, a SCSI status good bit used for FCP_RSP routing developed from bits 0-3 of word 2, byte 2, and bits 0-7 of word 2, byte 3 of an FCP_RSP payload, the R_CTL field value, the DID and SID field values, the TYPE field value and the OXID and RXID field values. This information allows the VFR block 558 to do the necessary table lookup and frame routing. Information is provided from the receive (RX) look up queue 630 to IO table lookup logic 632. The IO table lookup logic 632 is connected to the SRAM interface controller 634, which in turn is connected to the SRAM 508 which contains the IO lookup table. The IO lookup table is described in detail below. The frame information from the RX lookup queue 630 is received by the IO lookup table logic 632, which proceeds to interrogate the IO table to determine if an entry is present for the particular frame being received. This is preferably done by doing an address lookup based on the VXID value in the frame. If there is no VXID value in the table or in the frame, then this frame is forwarded to the VER 510 for proper handling, generally to develop a table entry in the table for automatic full speed handling. The outputs of the IO lookup table logic 632 are provided to the transmit routing logic 636. The output of the transmit (TX) routing logic either indicates that this is a frame to be properly routed and information is provided to the staging buffer management logic 620 and to a transmit queue 638 in the VFT block 560 or a frame that cannot be routed, in which case the transmit routing logic 636 provides the frame to the receive DMA queue 626 for routing to the VER 510. For example, all FCP_CMND frames are forwarded to the VER 510. FCP_XFER_RDY and FCP_DATA frames are forwarded to the TX queue 638, the VER 510 or both, based on values provided in the IO table, as described in more detail below. For FCP_RSP and FCP_CONF frames, the SCSI status bit and the FCP_CONF_REQ bits are evaluated and the good or bad response bit values in the IO table are used for routing to the TX queue 638, the VER 610 or both. In addition, in certain cases the IO table lookup logic 632 modifies the IO table. On the first frame from a responder the RXID value is stored in the IO table and its presence is indicated. On a final FCP_RSP that is a good response, the IO table entry validity bit is cleared as the exchange has completed and the entry should no longer be used. The transmit queue 638 also receives data from the transmit DMA controller 624 for frames being directly transferred from the VER 510. The information in the TX queue 638 is descriptor values indicating the staging buffer ID, and the new DID, SID, OXID, and RXID values. The transmit queue 638 is connected to VFT control logic 640 and to substitution logic 642. The VFT control logic 640 controls operation of the VFT block 560 by analyzing the information in the TX queue 638 and by interfacing with the staging buffer management logic 620 in the staging buffer block 556. The queue entries are provided from the TX queue 638 and from the staging buffer memory 610 to the substitution logic 642 where, if appropriate, the DID, SID and exchange ID values are properly translated as shown in FIG. 12. In the preferred embodiment the VDID value includes an 8 bit domain ID value, an 8 bit base ID value and an 8 bit virtual disk enumeration value for each port set. The domain ID value is preferably the same as the Bloom ASIC 504 connected to the port set, while the base ID value is an unused port ID value from the Bloom ASIC 504. The virtual disk enumeration value identifies the particular virtual disk in use. Preferably the substitution logic only translates or changes the domain ID and base ID values when translating a VDID value to a PDID value, thus keeping the virtual disk value unchanged. With this ID value for the virtualization switch 500, it is understood that the routing tables in the connected Bloom ASICs 504 must be modified from normal routing table operation to allow routing to the ports of the pi FPGA 502 over the like identified parallel links connecting the Bloom ASIC 504 with the pi FPGA 502. The translated frame, if appropriate, is provided from the substitution logic 642 to a CRC generator 644 in the FC-1(T) block 552. The output of the CRC generator 644 is provided to the transmit (TX) eight bit to ten bit encoding logic block 646 to be converted to proper Fibre Channel format. The eight bit to ten bit encoding logic also receives outputs from a TX primitives logic block 648 to create transmit primitives if appropriate. Generation of these primitives would be indicated either by the VFT control logic 640 or FC-1(T) control logic 650. The FC-1(T) control logic 650 is connected to buffer to buffer credit logic 652 in the FC-1 block 554. The buffer to buffer credit logic 652 is also connected to the receive primitives logic 614 and the staging buffer management logic 620. The output of the transmit eight bit to ten bit logic 646 and an output from the receive FIFO 600, which provides fast, untranslated fabric switching, are provided as the two inputs to a multiplexer 654. The output of the multiplexer 654 is provided to a transmit output block 656 for final provision to the transmit serializer/deserializers and media interfaces. Turning now to FIG. 19, a more detailed description of the VER 510 is shown. Preferably the processor 512 of the VER 510 is a highly integrated processor such as the PowerPC 405 GP provided by IBM. Thus many of the blocks shown in FIG. 19 are contained on the actual processor block itself. The VER 510 includes a CPU 650, as indicated preferably the PowerPC CPU. The CPU 650 is connected to a VER bus 566. A bus arbiter 652 arbitrates access to the VER bus 566. An SDRAM interface 654 having blocks including queue management, memory window control and SDRAM controller is connected to the VER bus 566 and to the SDRAM 514. As indicated in FIG. 19, preferably the SDRAM 514 is broken down into a number of logical working blocks utilized by the VER 510. These include Free Mirror IDs, which are utilized based on an FCP write command to a virtualization device designated as a mirroring device 656; a Free Exchange ID list 658 for use with the command frames that are received; a Free Exchange ID list 660 for general use; a work queue 662 for use with command frames; a work queue 664 for operation with other frames and PCI DMA queues 666 and 668 for inbound and outbound or receive and transmit DMA operations. A PCI DMA interface 670 is connected between the VER bus 566 and the PCI bus 520, which is connected to the processor 524. 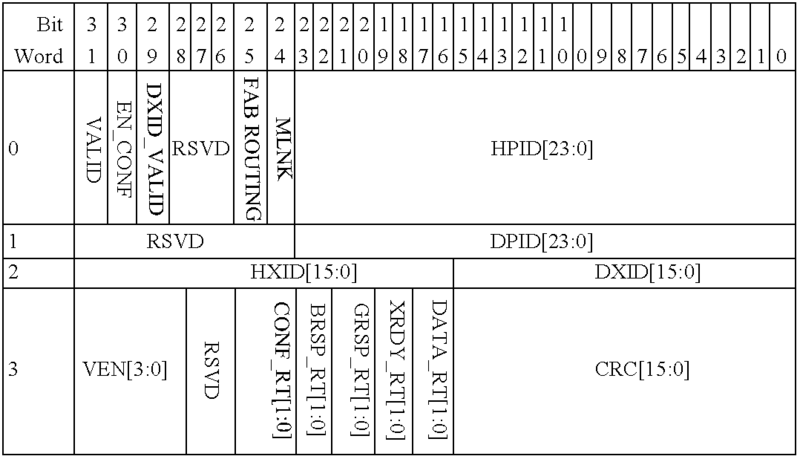 In addition a PCI controller target device 672 is also connected between the VER bus 566 and the PCI bus 520. The boot flash 516 as previously indicated is connected to the VER bus 566. FIG. 20 illustrates an alternative virtualization switch 700. Virtualization switch 700 is similar to the virtualization switch 500 of FIG. 16 and like elements have been provided with like numbers. The primary difference between the switches 700 and 500 is that the pi FPGA 502 and the VERs 510 have been replaced by alpha FPGAs 702. In addition, four alpha blocks 702 are utilized as opposed to two pi FPGA 502 and VER 510 units. The block diagram of the alpha FPGA 702 is shown in FIG. 21. As can been seen, the basic organization of the alpha FPGA 702 is similar to that of the pi FPGA 502 except that in addition to the pi FPGA functionality, the VER 510 has been incorporated into the alpha FPGA 702. Preferably multiple VERs 510 have been incorporated into the alpha FPGA 702 to provide additional performance or capabilities. FIG. 22 illustrates the general operation of the switches 500 and 700. Incoming frames are received into the VFR blocks for incoming routing in step 720. If the data frames have a table entry indicating that they can be directly translated, control proceeds to step 722 for translation and redirection. Control then proceeds to step 724 where the VFT block transmits the translated or redirected frames. If the VFR block in step 720 indicates that these are exception frames, either Command Frames such as FCP_CMND or FCP_RSP or unknown frames that are not already present in the table, control proceeds to step 726 where the VER performs table setup and or teardown, depending upon whether it is an initial frame or a termination frame, or further processing or forwarding of the frame. If the virtual disk is actually spanning multiple physical drives and the end of one disk has been reached, then the VER in step 726 performs proper table entries and LUN and LBA changes to form an initial command frame for the next physical disk. Alternatively, if a mirroring operation is to be performed, this is also set up by the VER in step 726. After the table has been set up for the translation and redirection operation, the command frames that have been received by the VER are provided to step 722 where they are translated using the new table entries. If the frames have been created directly by the VER in step 726, such as the initial command for the second drive in the spanning case, these frames are provided directed to the VFT block in step 724. If the VER cannot handle the frame, as it is an error or an exception above its level of understanding, then the frame is transferred to the processor 524 for further handling in step 728. Either error handling is done or communications with the management server are developed for overall higher level communication and operation of the virtual switch 500, 700 in step 728. Frames created by the processor 524 are then provided to the VFT block in step 724 for outgoing routing. FIG. 23 is an illustration of various relevant buffers and memory areas in the alpha FPGA 702 or the pi FPGA 502 and the VER 510. An approximate breakdown of logical areas inside the particular memories and buffers is illustrated. For example, the IO table in the SRAM 508 preferably has 64 k of 16 byte entries which include the exchange source IDs and destination IDs in the format as shown in Tables 1 and 2 below. BRSP_RT field of the IO entry. the frame needs to go out the other port set. last entry in the mirror group has this bit set to 0.
to route those frames to the VER only. For not mirror IO, this bit is set to 0.
assumes MLNK = 0 for all other frames. PDISK and then a copy to the VER. requirements of a Good FCP_RSP as defined above. RT[1:0] as DATA_RT but applies to FCP_CONF frames. to the entry consumers (typically the VFX). As shown, the VER memory 514 contains buffer space to hold a plurality of overflow frames in 2148 byte blocks, a plurality of command frames which are being analyzed and/or modified, context buffers that provide full information necessary for the particular virtualization operations, a series of blocks allocated for general use by each one of the VERs and the VER operating software. Internal operation of the VFR block routing functions of the pi FPGA 502 and the alpha FPGA 702 are shown in FIGS. 24A and 24B. Operation starts in step 740 where it is determined if an RX queue counter is zero, indicating that no frames are available for routing. If so, control proceeds to step 740 waiting for a frame to be received. If the RX queue counter is not zero, indicating that a frame is present, control proceeds to step 742, where the received buffer descriptor is obtained and a mirroring flag is set to zero. Control proceeds to step 744 to determine if the base destination ID in the frame is equal to the port set ID for the VX switch 500, 700. If not the same base ID, control proceeds to step 746 to determine if the switch 500, 700 is in a single fabric shared bandwidth mode. In the preferred embodiments, the pi FPGAs 502 and Alpha FPGAs 702 in switches 500, 700 can operate in three modes: dual fabric repeater, single fabric repeater or single fabric shared bandwidth. In dual fabric mode, only virtualization frames are routed to the switches 500, 700, with all frames being translated and redirected to the proper fabric. Any non-virtualization frames will be routed by other switches in the fabric or by the Bloom ASIC 504 pairs. This dual fabric mode is one reason for the pi FPGA 502 and Alpha FPGAs 702 being connected to separate Bloom ASIC 504 pairs, as each Bloom ASIC 504 pair would be connected to a different fabric. In the dual fabric case, the switch 500, 700 will be present in each fabric, so the switch operating system must be modified to handle the dual fabric operation. In single fabric repeater mode, ports on the pi FPGA 502 or Alpha FPGA 702 are designated as either virtualization ports or non-virtualization ports. Virtualization ports operate as described above, while non-virtualization ports do not analyze any incoming frames but simply repeat them, for example by use of the fast path from RX FIFO 600 to output mux 654, in which case none of the virtualization logic is used. In one alternative the non-virtualized ports can route the frames from an RX FIFO 600 in one port set to an output mux 654 of a non-virtualized port in another port set. This allows the frame to be provided to the other Bloom ASIC 504 pair, so that the switches 500 and 700 can then act as normal 16 port switches for non-virtualized frames. This mode allows the switch 500, 700 to serve both normal switch functions and virtualization switch functions. The static allocation of ports as virtualized or non-virtualized may result in unused bandwidth, depending on frame types received. In single fabric, shared bandwidth mode all traffic is provided to the pi FPGA 502 or Alpha FPGA 702, whether virtualized or non-virtualized. The pi FPGA 502 or Alpha FPGA 702 analyzes each frame and performs translation on only those frames directed to a virtual disk. This mode utilizes the full bandwidth of the switch 500, 700 but results in increased latency and some potential blocking. Thus selection of single fabric repeater or single fabric shared mode depends on the makeup of the particular environment in which the switch 500, 700 is created. If in single fabric, shared bandwidth mode, control proceeds to step 748 where the frame is routed to the other set of ports in the virtualization switch 500, 700 as this is non-virtualized frame. This allows the frame to be provided to the other Bloom ASIC 504 pair, so that the switches 500 and 700 can then act as normal 16 port switches for non-virtualized frames. If not, control proceeds to 750 where the frame is forwarded to the VER 510 as this is an improperly received frame and the control returns to step 740. If in step 744 it was determined that the frame was directed to the virtualization switch 500, 700, control proceeds to step 747 to determine if this particular frame is an FCP_CMND frame. If so, control proceeds to step 750 where the frame is forwarded to the VER 510 for IO table set up and other initialization matters. If it is not a command frame, control proceeds to step 748 to determine if the exchange context bit in the IO table is set. This is used to indicate whether the frame is from the originator or the responder. If the exchange context bit is zero, this is a frame from the originator and control proceeds to step 750 where the receive exchange ID value in the frame is used to index into the IO table, as this is the VXID value provided by the switch 500, 700. Control then proceeds to step 752 where it is determined if the entry into the IO table is valid. If so, control proceeds to step 754 to determine if the source ID in the frame is equal to the host physical ID in the table. If the exchange context bit is not zero in step 748, control proceeds to step 756 to use the originator exchange ID to index into the IO table as this is a frame from the responder. In step 758 it is determined if the IO table entry is valid. If so, control proceeds to step 760 to determine if the source ID in the frame is equal to the physical disk ID value in the table. If the IO table entries are not valid in steps 752 and 758 or the IDs do not match in steps 754 and 760, control proceeds to step 750 where the frame is forwarded to the VER 510 for error handling. If however the IDs do match in step 754 and 760, control proceeds to step 762 to determine if the destination exchange ID valid bit in the IO table is equal to one. If not, control proceeds to step 764 where the DX_ID value is replaced with the responder exchange ID value as this is the initial response frame which provides the responder exchange ID value, the physical disk RXID value in the examples of FIG. 12, and the DX_ID valid bit is set to one. If it is valid in step 762 or after step 764, control proceeds to step 766 to determine if this is a good or valid FCP_RSP or response frame. If so, the table entry valid bit is set to zero in step 768 because this is the final frame in the sequence and the table entry can be removed. After step 768 or if it is not a good FCP_RSP frame in step 766, control proceeds to step 770 to determine the particular frame type and the particular routing control bits from the IO table to be utilized. If in step 772 the appropriate routing control bits are both set to zero, control proceeds to step 774 as this is an error condition in the preferred embodiments and then control returns to step 740. If the bits are not both zero in step 772, control proceeds to step 778 to determine if the most significant of the two bits is set to one. If so, control proceeds to step 780 to determine if the fabric routing bit is set to zero. As mentioned above, in the preferred embodiment the virtualization switches 500 and 700 can be utilized to virtualize devices between independent and separate fabrics. If the bit is set to zero, control proceeds to step 782, where the particular frame is routed to the transmit queue of the particular port set in which it was received. If the bit is not set to zero, indicating that it is a virtualized device on the other fabric, control proceeds to step 784 where the frame is routed to the transmit queue in the other port set. After steps 782 or 784 or if the more significant of the two bits is not one in step 778, control proceeds to step 774 to determine if the least significant bit is set to one. If so, this is an indication that the frame should be routed to the VER 510 in step 776. If the bit is not set to one in step 774 or after routing to the VER 510 in step 776, control proceeds to step 786 to determine if the mirror control bit MLNK is set. This is an indication that write operations directed to this particular virtual disk should be mirrored onto duplicate physical disks. If the mirror control bit MLNK is cleared, control proceeds to step 740 where the next frame is analyzed. In step 786 it was determined that the mirror control bit MLNK is set to one, control proceeds to step 788 where the next entry in the IO table is retrieved. Thus contiguous table entries are used for physical disks in the mirror set. The final disk in the mirror set will have its mirror control bit MLNK cleared. Control then proceeds to step 778 to perform the next write operation, as only writes are mirrored. FIG. 24 c illustrates the general operation of the VFT block 560. Operation starts at step 789, where presence of any entries in the TX queue 638 is checked. If none are present, control loops at step 789. If an entry is present, control proceeds to step 790 where the TX buffer descriptor is obtained from the TX queue 638. In step 791, the staging buffer ID is provided to the staging buffer management logic 620 so that the frame can be retrieved and the translation or substitution information is provided to the substitution logic 642. In step 792 control waits for a start of frame (SOF) character to be received and for the Fibre Channel transmit link to be ready. When SOF is received and the link is ready, control proceeds to step 793 where the frame is sent. Step 794 determines if a parity error occurred. If none, control proceeds to step 795 to look for an end of frame (EOF) character. If none, control returns to step 793 and the frame is continued to be sent. If the EOF was detected, the frame is completed and control proceeds to step 799 where IDLES are sent on the Fibre Channel link and the TX frame status counter in the staging buffer 556 is decremented control returns to step 739 for the next frame. If a parity error occurred, control proceeds from step 794 to step 796 to determine if the frame can be refetched. If so, control proceeds to step 797 where the frame is refetched and then to step 789. If no refetch is allowed, control proceeds to step 798 where the frame is discarded and then to step 799. FIG. 25 generally shows the operation of the VERs 510 of switches 500, 700. Control starts at step 1400, where the VER 510 is initialized. Control proceeds to step 1402 to process any virtualization maps entries which have been received from the virtualization manager (VM) in the switch 500, 700, generally the processor 524. The virtualization map is broken into two portions, a first level for virtual disk entries and a second level for the extent maps for each virtual disk. The first level contains entries which include the virtual disk ID, the virtual disk LUN, number of mirror copies, pointer to an access control list and others. The second level includes extent entries, where extents are portions of a virtual disk that are contiguous on a physical disk. Each extent entry includes the physical and virtual disk LBA offsets, the extent size, the physical disk table index, segment state and others. Preferably the virtualization map lookups occur using the CAM 518, so the engine 510 will load the proper information into the CAM 518 to allow quick retrieval of an index value in memory 514 where the table entry is located. After processing any map entries, control proceeds to step 1404 where any new frames are processed, generally FCP_CMND frames On FCP_CMND frames a new exchange is starting so several steps are required. First, the engine 510 must determine the virtual disk number from the VDID and LUN values. A segment number and the IO operation length are then obtained by reference to the SCSI CDB. If the operation spans several segments, then multiple entries will be necessary With the VDID and LUN a first level lookup is performed. If it fails, the engine 510 informs the virtualization manager of the error and provides the frame to the virtualization manager. If the lookup is successful, the virtual disk parameters are obtained from the virtualization map. A second level lookup occurs next using the LBA, index and mirror count values. If this lookup fails, then handling is requested from the virtualization manager. If successful, the table entries are retrieved from the virtualization map. With the retrieved information the PDID value is obtained, the physical offset is determined and a spanning or mirrored determination is made. This procedure must be repeated for each spanned or mirrored physical disk. Next the engine 510 sets up the IO table entry in its memory and in the SRAM 508. With the IO table entry stored, the engine 510 modifies the received FCP_CMND frame by doing SID, DID and OXID translation, modifying the LUN value as appropriate and modifying the LBA offset. The modified FCP_CMND frame is then provided to the TX DMA queue for transmission by the VFT block 560. After the FCP_CMND frames have been processed, control proceeds to step 1406 where any raw frames from the virtualization manager are processed. Basically this just involves passing the raw frame to the TX DMA queue. After step 1406 any raw frames from the VFR block 558 are processed in step 1408. These frames are usually FCP_RSP frames, spanning disk change frames or error frames. If the frame is a good FCP_RSP frame, the IO table entry in the memory 514 and the SRAM 508 is removed or invalidated and availability of another entry is indicated. If the frame is a bad FCP_RSP frame, the engine 510 will pass the frame to the virtualization manager. If the frame is a spanning disk change frame, a proper FCP_CMND frame is developed for transmission to the next physical disk and the IO table entry is modified to indicate the new PDID. On any error frames, these are passed to the virtualization manager. After the raw frames have been processed in step 1408, control proceeds to step 1410 where an IO timeout errors are processed. This situation would happen due to errors in the fabric or target device, with no response frames being received. When a timeout occurs because of this condition the engine 510 removes the relevant entry from the IO tables and frees an exchange entry. Next, in steps 1412 and 1414 the engine 510 controls the DMA controller 670 to transfer information to the virtualization manager or from the virtualization manager. On received information, the information is properly placed into the proper queue for further handling by the engine 510 . After DMA operations, any further exceptions are processed in steps 1416 and then control returns to step 1402 to start the loop again. Proceeding then to FIG. 26, a general block diagram of the virtualization switch 500 or 700 hardware and software is shown. Block 800 indicates the hardware as previously described. For example, the pi FPGA 502—based switch 500 or the alpha FPGA 702-based switch 700 is shown. As can be seen the virtualization switch 500, 700 could also be converted into a blade-based format for inclusion in the Silkworm 12000 similar to the embodiments previously shown in FIGS. 13 and 15. In addition, alternative embodiments based on designs to be described in FIGS. 26 and following are shown. Block 802 is the basic software architecture of the virtualizing switch. Generally think of this as the switch operating system and all of the particular modules or drivers that are operating within that embodiment. This block 802 would be duplicated if the switch 500, 700 was operating in dual fabric mode, one instantiation of block 802 for each fabric. One particular block is the virtualization manager 804 which operates with the VERs 510 in the switch. The virtualization manager 804 also cooperates with the management server to handle virtualization management functions, including initialization similar to that described above with respect to switch 400. The virtualization manager 804 has various blocks including a data mover block 806, a target emulation and virtual port block 808, a mapping block 810, a virtualization agent API management block 812 and an API converter block 814 to interface with the proper management server format, an API block 816 to interface the virtualization manager 804 to the operating system 802 and driver modules 818 to operate with the ASICs and FPGA devices in the hardware. Other modules operating on the operating system 802 are Fibre Channel, switch and diagnostic drivers 820; port and blade modules 822, if appropriate; a driver 824 to work with the Bloom ASIC; and a system module 826. In addition, because this is a fully operational switch as well as a virtualization switch, the normal switch modules for switch management and switch operations are generally shown in the dotted line 820. This module will not be explained in more detail. An alternative embodiment of a virtualizing switch according to the present invention is shown in FIG. 27 as virtualizing switch 850 which is described in more detail in FIGS. 28 and beyond. In the switch 850, the virtualization translation hardware VFX (for VFR and VFT) is located at each port of the switch forming VFX ports 852 and are connected to a centralized VER and virtualization control module set 854. In the illustrated embodiment a series of hosts 856 are connected to a first SAN fabric 858 which is also connected to a series of VFX ports 852 on the switch 850. A series of physical disks 860 are connected to a second SAN fabric 862 which is also connected to a series of VFX ports 852. An additional port 864 on the switch 850 is connected to a third fabric 866 which is also connected to a virtualization or management server 868. Alternatively, the management server 868 could be a blade or service provider inside the switch 850. It is understood that the illustrated SAN fabrics 858, 862, and 866 could be separate fabrics, a single fabric or two fabrics. It is also understood that the hosts 856, physical disks 860 and management server 868 could be distributed among the various fabrics, not separated to particular fabrics as shown. FIG. 28 illustrates in generic block diagram of the switch 850. This is referred to as a central memory architecture or CMA design. The CMA design is a distributed architecture having a plurality of central memory chips to distribute the general frame memory storage needed in a switch and also provide messaging between various front end chips. Chips referred to as Phoenix chips 872 are preferably used to form the central memory but also can be sufficiently flexible to allow generalized storage of the virtualization IO tables as done in the virtualization switches 500 and 700 and to control message transfer between the front end chips. In the preferred embodiment a first front end ASIC, referred to as the Falcon ASIC 870, is connected to a series of Fiber Channel ports and interconnected to a series of Phoenix chips 872. A plurality of the Phoenix chips 872 are configured as central memory agents and are interconnected logically to form a central memory agent 874. In addition, as virtualization is occurring, a series of the Phoenix chips 872 are configured as virtualization table agents and are logical interconnected to form a virtualization IO table space 876, with these Phoenix chips 872 also connected to the Falcon ASIC 870. An additional Phoenix chip 878 is configured to provide messaging services between the various front end chips, so it is also connected to the Falcon ASIC 870. An additional Falcon ASIC 870 is interconnected to a pair of Egret chips 880. The Egret chips 880 are connected to 10 GFC ports and connected to the Falcon ASIC 870 over a series of Fibre Channel ports. Thus, the Egret chip 880 performs a 10 GFC to 2 Gb conversion. Again, this Falcon chip 870 is also connected to the Phoenix chips 872 in the central memory agent 874, to the Phoenix chips 872 in the virtualization IO table 876 and to the messaging Phoenix chip 878. An Infiniband conversion chip 882 is connected to a series of 4X Infiniband links and also to the Phoenix chips 872 in the central memory agent 874, to the virtualization IO tables 876 and the messaging Phoenix chip 878. An iSCSI chip 884 is connected to a series of ten Gigabit Ethernet ports and performs protocol conversion The iSCSI chip 884 is connected by two point to point links to a CMA to SPI-4 conversion chip 886. SPI-4 is an industry standard link protocol. The CMA to SPI-4 conversion chip 886 converts between the SPI-4 format and the CMA format, so that the iSCSI chip 884 and the CMA to SPI-4 chip 886 effectively convert iSCSI protocol to CMA protocol. The CMA to SPI-4 chip 886 is similarly connected to the central memory agent 874, virtualization IO tables 876 and the messaging Phoenix chip 878. A second CMA to SPI-4 conversion chip 886 is connected to the central memory agent 874, the virtualization tables 876 and the messaging Phoenix chip 878. This CMA to SPI-4 conversion chip 886 is connected to a VER 888, which is also connected to a multiprocessor unit 890 which operates the control software as in the previous switches. In this embodiment the VERs are in the VER 888 and the virtualization manager is operating on the multiprocessor unit 890. However, to increase performance, multiple VERs 888 can be utilized, either with a single CMA to SPI-4 conversion chip 886 or multiple chips 886, with the VERs 888 preferably connecting to a single multiprocessor unit 890. With this architecture multiple protocols can be utilized with uniform frame storage in the central memory agent and uniform access to the virtualization IO tables. Thus, only a single virtualization IO table is necessary for the plurality of different port types being utilized and only a single VER 888 is needed to perform all the control operations for the entire switch 850, as opposed to the approaches of virtualization switches 500 and 700, where separate devices would be required. FIG. 29 illustrates the internal architecture of a Bloom ASIC 504 for reference purposes. Shown is the half-chip or quad logic that forms one half of a Bloom ASIC 504. Various components serve a similar function as those illustrated and described in U.S. Pat. No. 6,160,813, which is hereby incorporated by reference in its entirety. Each one-half of a Bloom ASIC 504 includes four identical receiver/transmitter circuits 1300, each circuit 1300 having one Fibre Channel port, for a total of four Fibre Channel ports. Each circuit 1300 includes a SERDES serial link 1218, preferably located off-chip but illustrated on chip for ease of understanding; receiver/transmitter logic 1304 and receiver (RX) routing logic 1306. Certain operations of the receiver/transmitter logic 1304 are described in more detail below. The receiver routing logic 1306 is used to determine the destination physical ports within the local fabric element of the switch to which received frames are to be routed. Each receiver/transmitter circuit 1300 is also connected to statistics logic 1308. Additionally, Buffer-to-Buffer credit logic 1310 is provided for determining available transmit credits of virtual channels used on the physical channels. Received data is provided to a receive barrel shifter or multiplexer 1312 used to properly route the data to the proper portion of the central memory 1314. The central memory 1314 preferably consists of thirteen individual SRAMs, preferably each being 10752 words by 34 bits wide. Each individual SRAM is independently addressable, so numerous individual receiver and transmitter sections may be simultaneously accessing the central memory 1314. The access to the central memory 1314 is time sliced to allow the four receiver ports, sixteen transmitter ports and a special memory interface 1316 access every other time slice or clock period. The receiver/transmitter logic 1304 is connected to buffer address/timing circuit 1320. This circuit 1320 provides properly timed memory addresses for the receiver and transmitter sections to access the central memory 1314 and similar central memory in other duplicated blocks in the same or separate Bloom ASICs 504. An address barrel shifter 1322 receives the addresses from the buffer address/timing circuits 1320 and properly provides them to the central memory 1314. A transmit (TX) data barrel shifter or multiplexer 1326 is connected to the central memory 1314 to receive data and provide it to the proper transmit channel. As described above, two of the quads can be interconnected to form a full eight port circuit. Thus transmit data for the four channels illustrated in FIG. 29 may be provided from similar other circuits. This external data is multiplexed with transmit data from the transmit data barrel shifter 1326 by multiplexers 1328, which provide their output to the receiver/transmitter logic 304. In a fashion similar to that described in U.S. Pat. No. 6,160,813, RX-to-TX queuing logic 1330, TX-to-RX queuing logic 1332 and a central message interface 1334 are provided and perform a similar function, and so will not be explained in detail. The block diagram of the Falcon chip 870 is shown in FIG. 30 to be contrasted with the Bloom ASIC 504 of FIG. 29 and the pi FPGA 502. An external port cluster 900 is utilized to interface with the Fibre Channel fabric, with one external port cluster 900 per external port. The external port clusters 900 are connected to a port sequencer 902 and to receive queuing 904. The port sequencer 902 provides an output to a VFR block 906, which performs virtualization tasks as in the designs of switches 500 and 700. The receive queuing 904 and the VFR block 906 are connected to a receive routing block 908 to determine the proper routing of the particular frame. The receive queuing 904 is also connected to a special memory interface block 910 which is connected to a time slot manager 912 which operates to handle the timing of transfers from the Falcon chip 870 to the various Phoenix chips 872 and 878 depending upon the particular direction and routing of the particular frame. The time slot manager 912 is also directly connected to the receive queuing 904 and to the external port clusters 900. The time slot manager 912 is also generally connected to internal port quads 914 which provide the actual interface to the Phoenix chips 872. As noted, these are quads, indicating that there are four ports per particular quad, and in the preferred embodiment there are four quads present in a Falcon ASIC 870. A message logic block 916 is connected to the internal port quads 914 and to the receive queuing block 904. In addition, the message logic block 916 is connected to a transmit queuing block and scheduler 918. The transmit queuing block 918 is connected to a VFT block 920 which operates to perform translation as in the prior described embodiments. The VFT block 920 and the time slot manager 912 are connected to a series of transmit FIFOs 922, a series of multiplexers 924 and final VFT multiplexers 926 as previously described. The output of these FIFOs 922 and multiplexer chain 924 and 926 is provided to frame filtering hardware 928 as described in the Bloom ASIC 504 and more particularly in patent application Ser. No. 10/124,303 as previously incorporated by reference. The output of the frame filtering block 928 is provided to the external port clusters 900 for actual transmission of the frame from the Falcon chip 870 to the Fibre Channel fabric. FIG. 31 more completely illustrates the design of an internal port quad 914. A series of registers and consolidated PCI interfaces 930 are connected to a PCI bus for control purposes. The register and consolidated PCI interface 930 also is connected to each of the four internal port logic blocks 932, which perform the actual conversion and handling of the serial frame information as is required for the Phoenix chip 872 link. The output of the logic blocks 932 are provided to serial/deserializers 934, whose outputs and inputs are connected by buffers to the particular Phoenix chips 872. The internal port logic blocks 932 are also connected to the time slot manager 912, the VFR block 906 and the message logic 916 as indicated in FIG. 30 to interchange data with the remainder of the Falcon ASIC 870. A high level block diagram of the external port cluster 900 is shown in FIG. 32. A consolidated PCI interface 938 is provided for interconnection to a PCI bus for unit control, with registers relating to optical module status and control, serial/deserializer control and internal block interfaces. The serial frame channel data from the Fibre Channel optical modules is provided to a serial/deserializer 940 and then to a receiver/transmitter/arbitrated loop port or GPL 942. A buffer to buffer credit block 944 is connected to the port 942 to handle credit as conventional in a Fibre Channel switch. The buffer to buffer credit block 944 is connected to the transmit queuing scheduler 918 and the receive queuing block 904. The port 942 is also connected and provides data to a receive FIFO 948 for initial synchronization operations, which then provides data to the receive queuing block 904 and information to the time slot manager 912. An output of the port 942 is additionally provided to a phantom private to public translation block 950. Operation of this block 950 is generally described in U.S. Pat. No. 6,401,128, which is hereby incorporated by reference. The output of the phantom private to public block 950 is provided to the port sequencer 902. Data from the frame filtering block 928 is similarly provided to a phantom public to private block 952 to perform the inverse operation of block 950 if necessary. The output of the block 952 is provided to the port 942 and then the frame is transmitted out of the Falcon ASIC 870. As illustrated by these descriptions of the preferred embodiments, systems according to the present invention provide improve virtualization of storage units by handling the virtualization in switches in the fabric itself. The switches can provide translation and redirection at full wire speed for established sequences, thus providing very high performance, allowing greater use of virtualization, which in turns simplifies SAN administration and reduces system cost by better utilizing storage unit resources. wherein said CPU provides entries containing physical storage unit addressing information into said virtualization table if a frame received by said HBA and directed to a virtualized storage unit does not have physical storage unit addressing information stored in said virtualization table. 2. The device of claim 1, wherein said translation table includes a first portion coupled to said HBA and said CPU for access by said HBA and said CPU and a second portion coupled to said CPU for access by said CPU. 3. The device of claim 2, wherein said frame memory and said translation table first portion are contained in a common memory. 4. The device of claim 2, wherein said translation table first portion is contained in said HBA. wherein said CPU is programmed to provide entries containing physical storage unit addressing information into said virtualization table if a frame received by said second HBA and directed to a virtualized storage unit does not have physical storage unit addressing information stored in said virtualization table. 6. The device of claim 5, wherein said translation table includes a first portion coupled to said HBA and said CPU for access by said HBA and said CPU, a second portion coupled to said CPU for access by said CPU and a third portion coupled to said second HBA and said CPU for access by said second HBA and said CPU. 7. The device of claim 6, wherein said second frame memory and said translation table third portion are contained in a common memory. 8. The device of claim 7, wherein said translation table third portion is contained in said second HBA. wherein said CPU is programmed to provide entries containing physical storage unit addressing information into said virtualization table if a frame received by said HBA and directed to a virtualized storage unit does not have physical storage unit addressing information stored in said virtualization table. 10. The fabric of claim 9, wherein said translation table includes a first portion coupled to said HBA and said CPU for access by said HBA and said CPU and a second portion coupled to said CPU for access by said CPU. 11. The fabric of claim 10, wherein said frame memory and said translation table first portion are contained in a common memory. 12. The fabric of claim 10, wherein said translation table first portion is contained in said HBA. 14. The fabric of claim 13, wherein said translation table includes a first portion coupled to said HBA and said CPU for access by said HBA and said CPU, a second portion coupled to said CPU for access by said CPU and a third portion coupled to said second HBA and said CPU for access by said second HBA and said CPU. 15. The fabric of claim 14, wherein said second frame memory and said translation table third portion are contained in a common memory. 16. The fabric of claim 15, wherein said translation table third portion is contained in said second HBA. 18. The network of claim 17, wherein said translation table includes a first portion coupled to said HBA and said CPU for access by said HBA and said CPU and a second portion coupled to said CPU for access by said CPU. 19. The network of claim 18, wherein said frame memory and said translation table first portion are contained in a common memory. 20. The network of claim 18, wherein said translation table first portion is contained in said HBA. 22. The network of claim 21, wherein said translation table includes a first portion coupled to said HBA and said CPU for access by said HBA and said CPU, a second portion coupled to said CPU for access by said CPU and a third portion coupled to said second HBA and said CPU for access by said second HBA and said CPU. 23. The network of claim 22, wherein said second frame memory and said translation table third portion are contained in a common memory. 24. The network of claim 23, wherein said translation table third portion is contained in said second HBA. "Fibre Channel Generic Services (FC-GS) Rev 3.1," American National Standard for Information Systems, Aug. 7, 1996. "Fibre Channel Methodologies for Interconnects (FC-MI) Rev 1.8," NCITS working draft proposed Technical Report, Sep. 28, 2001. "Fibre Channel Physical and Signaling Interface (FC-PH) Rev 4.3," pp. 15-31, 90-132 & 205-222, working draft proposed American National Standard for Information Systems, Jun. 1, 1994. "Fibre Channel Protocol for SCSI," American National Standards Institute, Inc., Apr. 8, 1996. "Fibre Channel Switch Fabric (FC-SW) Rev 3.3" NCITS working draft proposed American National Standard for information Technology, Oct. 21, 1997. "Fibre Channel Switch Fabric-2 (FC-SW-2) Rev 5.3" NCITS working draft proposed American National Standard for Information Technology, Jun. 26, 2001. "Fibre Channel-Fabric Generic Requirements (FC-FG)" American National Standards Institute, Dec. 4, 1996.